It’s that time of year again. On the sweltering sidewalks of New York, everyone is staying hydrated by keeping a cup of iced coffee within sipping distance at all times. But I’ve never been a big fan. Iced coffee only really tastes good with lots of milk and sugar, and I try to avoid the extra calories that involves; the melting ice dilutes the flavor; coffee shops in these parts charge more for an iced coffee, anyway; and then there’s the matter of all those extra plastic cups and lids generated by the fascination with summer’s icy brew. No, I think there’s a much better way of taking coffee iced: in the form of granita. I was reminded of it while reading a chapter in The Man Who Ate Everything, in which Vogue food critic Jeffrey Steingarten searches Italy for the perfect granita, stopping off in Palermo to join the local custom of breakfasting during hot-weather months on coffee granita into which pieces of brioche are dunked. Granita— differing from close cousin sorbet in the granular, yet fluffy texture of its ice crystals— is a perfect vehicle for delivering the punch of coffee or espresso in a truly refreshing manner. The ingredient list consists basically of coffee and sugar (with a dollop of whipped cream for serving recommended). But the best thing of all is that it’s incredibly easy to make. Coffee granita calls for no special skills, no special equipment, and it’s a great way to use up leftover coffee or espresso. Mix it up, freeze in a metal pan, and stir with a fork every once in a while to scrape up the crystals. It takes a bit of time to develop the right texture, but the effort involved is little more than giving the pan a stir when you get up from the couch to grab a snack. 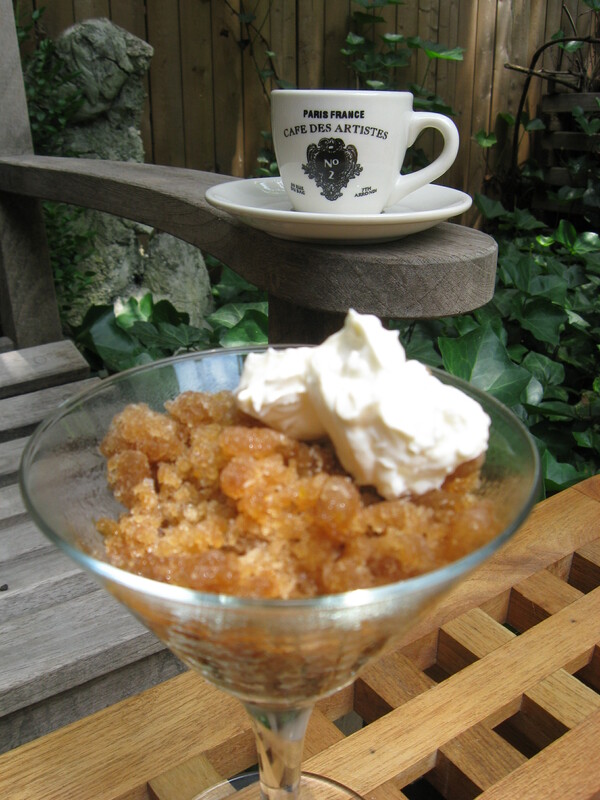 Once you’ve got the basic concept of granita-making down, the same technique can be used for other fruit and flavor varieties. We’ll be trying Watermelon Granita with Cardamom Syrup (also a good way to use up extra fruit), and Steingarten’s Chocolate Granita from Catania, which he turns into chocolate in garapegra, a “holy and noble elixir of fresh life” from the 18th-century, with the addition of some vanilla, orange zest, and a few drops of distilled jasmine.